A guide on how to find ebooks for your research. Find Ebooks available through Library sources. Watch this short tutorial to learn how to find ebooks in the library catalog. How can I find ebooks in the Library's collections? Are ebook versions of popular titles available? The Library’s ebook collections support teaching and research at the University. For popular titles, visit the Chicago Public Library, which has a large collection of popular ebooks. Can I download ebooks as PDFs? The Library provides access to ebooks through numerous platforms and downloading policies vary. Most platforms allow PDF downloads of portions of ebooks. Some allow downloads of complete works. For details, see Downloading E-books. Can I read ebooks on my ereader (Kindle, Nook)? Can multiple users view an ebook simultaneously? 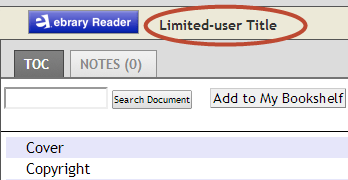 Many ebooks permit only one user at a time. If you are unable to access an ebook, try again later or ask a librarian for assistance. Full-text access to 125,000 multidisciplinary e-books representing a broad range of academic subject matter. Also includes over 4,000 public-domain e-books. Search and download thousands of full-text books in multiple academic and general interest subject areas. Includes all University of Chicago Press titles. Search full-text books in multiple academic and general interest subject areas, including 2500 University of Chicago Press titles. Access to most books published by Springer from 2005 and titles in book series from 1997. Search and download full text of books in the public domain and government documents. Offers electronic texts selected from the current output of American university presses, as well as those from a specially selected backlist of titles. American Council of Learned Societies (ACLS) project.